The collapse of the Soviet Union was the greatest shock to international affairs since World War II. In that perilous moment, Saddam Hussein invaded Kuwait and regimes throughout Eastern Europe and Asia teetered between democratic change and new authoritarian rule. 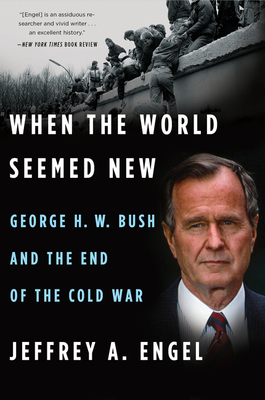 President Bush faced a world in turmoil that might easily have tipped into an epic crisis. As presidential historian Jeffrey Engel reveals in this page-turning history, Bush rose to the occasion brilliantly. Using handwritten letters and direct conversations—some revealed here for the first time—with heads of state throughout Asia and Europe, Bush knew when to push, when to cajole, and when to be patient. Based on previously classified documents, and interviews with all the principals, When the World Seemed New is a riveting, fly-on-the-wall account of a president with his calm hand on the tiller, guiding the nation from a moment of great peril to the pinnacle of global power. JEFFREY A. ENGEL is the founding director of the Center for Presidential History at Southern Methodist University. Educated at Cornell, Oxford, the University of Wisconsin-Madison, and Yale University. He has authored or edited ten books on American foreign policy, including The Fall of the Berlin Wall: The Revolutionary Legacy of 1989 and The China Diary of George H. W. Bush: The Making of a Global President. Born above the Mason-Dixon line, he now lives and teaches in Dallas, Texas.